Jeev Milkha Singh putted two bogies towards the end as he missed the cut in the European Open Golf tournament. Jeev, who shot even par 71 in first round added a 70 in second, but missed the cut as he ended at one-under 141, while the cut fell at three-under 139. Also missing the cut was Shiv Kapur (68-72), who missed it by just one shot. 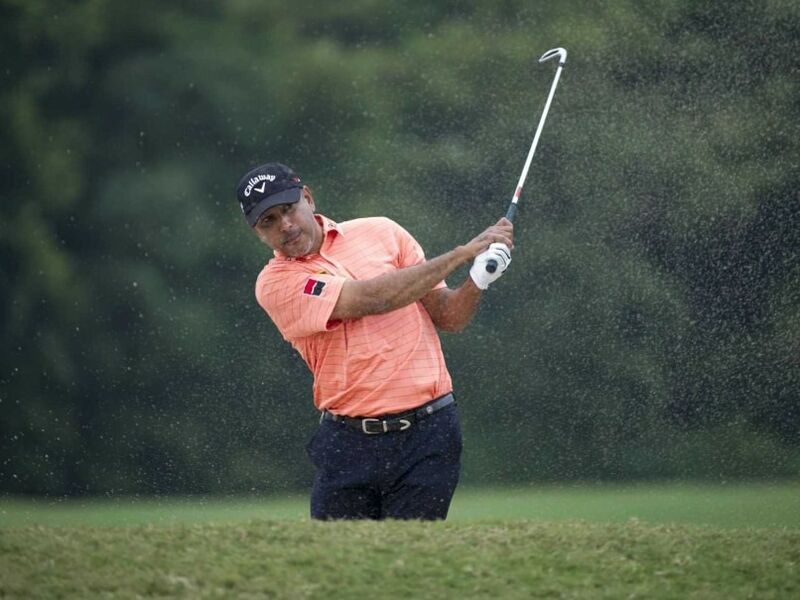 Jeev, who began with a bogey-double bogey on the second day fought back superbly with six birdies in next 12 holes, but gave away bogeys on 15th and 18th to make an early exit. Kapur had two bogeys and one birdie in his round. A stunning eagle on the back nine helped lift Graeme Storm into a share of the lead at the halfway stage of the Porsche European Open. The Englishman added a four-under 67 to his first round score of 65 to join countryman Ross Fisher and South Africa's Charl Schwartzel on ten-under. Byeong Hun-An and Richard McEvoy are one stroke further back on nine-under, with BMW PGA Champion Byeong firing an eagle, five birdies and a solitary bogey on Friday. Storm, who began the day one shot off the overnight lead, notched two birdies on his way to reaching the turn in 33. The 37-year-old started his back nine in style, chipping in for an eagle at the par five tenth to move to ten-under. Storm then dropped a shot at the 13th before saving par with an excellent ten foot putt at the 14th. After safely parring the 15th, Storm made a gain at the next to match the clubhouse target of ten under set by Schwartzel earlier in the day. Starting his round at the tenth tee, former Masters Tournament winner Schwartzel covered the front nine in 35, mixing eight pars with a birdie. He made another gain straight after the turn before chipping in from beside the green to save par at the short second. The 31 year old then added birdies at the third, fifth and eighth holes to head into the weekend on tied for the lead.